The family environment is the primary setting in which a child’s development will either thrive or be delayed. Parents, who understand normal child development, are less likely to be abusive and more likely to nurture their children’s healthy development. The strongest risk factor contributing to the development of behavioural and emotional problems in children is the quality of parenting a child receives [1 Encyclopedia on Early Child Development. Can changing parental knowledge, dysfunctional expectations and attributions, and emotion regulation improve outcomes for children? In: Morawska MR, Sanders A, Eds. Parental Skills, 3rd ed. University of Queensland, Australia, 2005.]. The quality of parenting is influential as it occurs during early childhood as stimulation is thought to have a special influence on early brain organization and on skill development [2Landry SH, Smith KE, Swank PR. Responsive parenting: establishing early foundations for social, communication, and independent problem-solving skills. Dev Psychol 2006; 42(4): 627-42. [http://dx.doi.org/10.1037/0012-1649.42.4.627] [PMID: 16802896] ]. A study conducted by Stright, Gallagher and Kelley [3Stright AD, Gallagher KC, Kelley K. Infant temperament moderates relations between maternal parenting in early childhood and childrens adjustment in first grade. Child Dev 2008; 79(1): 186-200. [http://dx.doi.org/10.1111/j.1467-8624.2007.01119.x] [PMID: 18269517] ] found that children who experienced a high quality parenting style during infancy and early childhood were more likely to have higher academic competence, better social skills, and better relationships with teachers and peers than children experiencing poorer quality parenting. Similarly, Jackson and Schemes [4Jackson AP, Schemes R. Single mothers' self-efficacy, parenting in the home environment, and children's development in a two-wave study. Soc Work Res 2005; 29: 7-20. [http://dx.doi.org/10.1093/swr/29.1.7] ] found that preschool children who have warm, supportive; and less authoritarian parents that provide cognitive stimulation, showed better cognitive and language abilities. Parenting style is defined as “the manner in which parents treat, communicate with, discipline, monitor, and support their children” [5Slicker E, Picklesimer B, Guzak A, Fuller D. The relationship of parenting style and older adolescent life skills development in the united states. Young 2005; 13: 227-45. [http://dx.doi.org/10.1177/1103308805054211] ]. Darling and Steinberg [6Darling N, Steinberg L. Parenting style as context: An integrative model. Psychol Bull 1993; 113: 487-96. [http://dx.doi.org/10.1037/0033-2909.113.3.487] ] posit that parenting styles moderate the relationship between parenting practices and developmental outcomes. Furthermore Darling and Steinberg [6Darling N, Steinberg L. Parenting style as context: An integrative model. Psychol Bull 1993; 113: 487-96. [http://dx.doi.org/10.1037/0033-2909.113.3.487] ] state that parenting style represents a constellation of attitudes towards the child that “taken together, create an emotional climate in which the parent’s behaviours are expressed”. Whilst parenting practices are directed toward the behaviour of the child, parenting style convey the parents’ attitude toward the child which can be denoted in the parents’ tone of voice or body language amongst other things [7Elstad JI, Stefansen K. Social variations in perceived parenting styles among norwegian adolescents. Child Indic Res 2014; 7: 649-70. [http://dx.doi.org/10.1007/s12187-014-9239-5] [PMID: 25132873] ]. A responsive parenting style allows children to feel safe in exploring their environment and in signalling their interests and needs. In addition responsive parenting provided consistently across early childhood establishes a solid foundation that is hypothesized to place children on a positive developmental trajectory that sustains beyond this developmental period [2Landry SH, Smith KE, Swank PR. Responsive parenting: establishing early foundations for social, communication, and independent problem-solving skills. Dev Psychol 2006; 42(4): 627-42. [http://dx.doi.org/10.1037/0012-1649.42.4.627] [PMID: 16802896] ]. Although parenting style is a contributing factor, parent knowledge of child development has also often been related to child development outcomes [1 Encyclopedia on Early Child Development. Can changing parental knowledge, dysfunctional expectations and attributions, and emotion regulation improve outcomes for children? In: Morawska MR, Sanders A, Eds. Parental Skills, 3rd ed. University of Queensland, Australia, 2005.]. Maternal cognition plays a pivotal role in parenting and child development [8Huang K, Caughy MO, Genevro JL, Miller TL. Maternal knowledge of child development and quality of parenting among White, African-American and Hispanic mothers. J Appl Dev Psychol 2005; 26: 149-70. [http://dx.doi.org/10.1016/j.appdev.2004.12.001] ]. An increase in the study of maternal cognition, which encompasses: maternal beliefs, goals, values, attitudes and knowledge of child development [9Bornstein MH, Cote LR, Haynes OM, Hahn CS, Park Y. Parenting knowledge: experiential and sociodemographic factors in European American mothers of young children. Dev Psychol 2010; 46(6): 1677-93. [http://dx.doi.org/10.1037/a0020677] [PMID: 20836597] ] provide a framework for understanding parental actions and the process of child development [10Tamis-LeMonda CS, Shannon J, Spellmann M. Low-income adolescent mothers’ knowledge about domains of child development. Infant Ment Health J 2002; 23: 88-103. [http://dx.doi.org/10.1002/imhj.10006] ]. Whilst there are various dimensions of parent cognition, knowledge of child development, however, is the most important [8Huang K, Caughy MO, Genevro JL, Miller TL. Maternal knowledge of child development and quality of parenting among White, African-American and Hispanic mothers. J Appl Dev Psychol 2005; 26: 149-70. The term parental knowledge or knowledge of child development can be defined as understanding the develop-mental norms and milestones, processes of child development, and familiarity with care-giving skills [8Huang K, Caughy MO, Genevro JL, Miller TL. Maternal knowledge of child development and quality of parenting among White, African-American and Hispanic mothers. J Appl Dev Psychol 2005; 26: 149-70. [http://dx.doi.org/10.1016/j.appdev.2004.12.001] ]. Similarly, Bornstein [11Bornstein MH, Cote LR, Haynes OM, Hahn CS, Park Y. Parenting knowledge: experiential and sociodemographic factors in European American mothers of young children. Dev Psychol 2010; 46(6): 1677-93. [http://dx.doi.org/10.1037/a0020677] [PMID: 20836597] ] describes parental knowledge of child development as the parents’ cognitions about how to facilitate the biological, physical, social and emotional needs of the developing child; the parents’ understanding of normative child development and the parents’ awareness regarding children’s health. A study conducted by Zand et al. [12Zand D, Pierce K, Thomson N, et al. Social competence in infants and toddlers with special health care needs: the roles of parental knowledge, expectations, attunement, and attitudes toward child independence. Children (Basel) 2014; 1(1): 5-20. [PMID: 27417463] ] attest to the positive relationship between parental knowledge of child development and early childhood outcomes. Parents that are more knowledgeable have more realistic expectations of themselves and their children, and they are more likely to behave in developmentally appropriate ways with their children [13Bornstein MH, Hahn CS, Suwalsky JT, Haynes OM. Socioeconomic status, parenting, and child development: the hollingshead four-factor index of social status and the socioeconomic index of occupations. In: Bornstein MH, Bradley RH, Eds. Socioeconomic status, parenting, and child development. Mahwah, NJ: Erlbaum 2003; pp. 29-82.]. When a mother is knowledgeable about child development she would most likely interact more sensitively to her child, which could promote and support healthy social and cognitive development. Similarly, Smith [14Smith TK. The relationship between knowledge, attributions and behavior in adolescent mothers: Implications for child outcomes. Santa Barbara: University of California 2001.] found that mothers with more knowledge of child development tend to use fewer love withdrawal and power assertive discipline strategies and use inductive reasoning. Conversely, a mother who is less knowledgeable of child development may have unrealistic expectations and adopt harsh and inconsistent discipline resulting in poor child developmental outcomes. Furthermore, mothers with unrealistic and distorted expectations are more likely to use severe discipline or abuse compared to their more knowledgeable counterparts [14Smith TK. The relationship between knowledge, attributions and behavior in adolescent mothers: Implications for child outcomes. Santa Barbara: University of California 2001.]. Mothers who are able to accurately judge their children’s abilities construct appropriate learning environments and interact with their children with better sensitivity [8Huang K, Caughy MO, Genevro JL, Miller TL. Maternal knowledge of child development and quality of parenting among White, African-American and Hispanic mothers. J Appl Dev Psychol 2005; 26: 149-70. [http://dx.doi.org/10.1016/j.appdev.2004.12.001] ]. Sensitivity refers to the affective quality of the emotional relationship between parent and child focusing on the mother’s accessibility and ability to respond to her child [15Biringen Z, Easterbrooks AE. Understanding relationships and relationship interventions. J Early Child Infant Psychol 2008; 4: 1-3.]. Furthermore it is also the primary means through which care-giving quality is expressed and relates to the quality of attachment between parent and child [16Zhou Q, Eisenberg N, Losoya SH, et al. The relations of parental warmth and positive expressiveness to childrens empathy-related responding and social functioning: a longitudinal study. Child Dev 2002; 73(3): 893-915. [http://dx.doi.org/10.1111/1467-8624.00446] [PMID: 12038559] ]. The child’s development of social and cognitive skills is thus influenced by the quality of interaction between child and caregiver. Parent-child interactions are particularly important during early years and the support provided by the parent in the child’s learning experiences allows for the more efficient development of skills. This interaction between parent and child centres on parenting which include discipline and control that form part of the strategies that are used to build socio-emotional and cognitive competence in children [17Akinsola EF. Relationship between parenting styles, family type, personality disposition and academic achievement of young people in Nigeria. Ife PsychologIA 2011; 19: 246. In general there are few studies relating to knowledge of child development and other skills such as parenting styles [1 Encyclopedia on Early Child Development. Can changing parental knowledge, dysfunctional expectations and attributions, and emotion regulation improve outcomes for children? In: Morawska MR, Sanders A, Eds. Parental Skills, 3rd ed. University of Queensland, Australia, 2005.]. Previous research indicates that a relationship exists between maternal cognition, particularly knowledge of child development, and parenting styles in early child development. The purpose of this systematic review was therefor to review and describe previous research studies to determine the association between knowledge of child development and parenting styles. A further purpose of this systematic review was to critically appraise the methodological quality of previous studies with the view to identify gaps in previous research in order to inform future research. Prior to the start of the systematic review, the authors reached consensus on the terms and definitions to be included in this review (Table 1). A comprehensive search, through the following databases: Ebscohost (Academic search complete, Africa-Wide information, PsychArticles, SocIndex, Cinahl), JStor, Sciencedirect, Springerlink, Pubmed and Sage, was conducted for the period between 2003-2014. After a brief review of available literature which included: knowledge of child development and parenting styles, parent knowledge of child development and parenting styles, maternal knowledge of child development and parenting styles, paternal knowledge of child development and parenting styles, child development knowledge and parenting styles, early childhood development and parenting styles, search terms were constructed and agreed upon by both reviewers. The titles and abstracts were retrieved independently by one researcher (SJS) and then screened by another researcher (NVR) using the same inclusion criteria as below in order to determine eligibility of the studies for inclusion to the review. The criteria for inclusion into the study were: (i) publication in English language; (ii) publication dates between 2003 and 2014; (iii) target population being parents with children; (iv) association between knowledge of child development and parenting or parenting styles. This systematic review included only quantitative and intervention studies to review the instruments used in these studies and to examine the association between knowledge of child development and parenting. The initial search was conducted by one researcher (SJS) and the titles and abstracts screened by another reviewer (NVR). The initial search on titles yielded a total 1591 - full text articles and abstract - across all the search terms based on the inclusion criteria agreed upon by the researchers. At this point the methodological approach of the studies was not considered as yet. In other words this total comprises of the total number of hits based on the search terms used. Thereafter the articles were screened for eligibility and a sample of 23 records was attained based on the inclusion criteria. At this point the articles were roughly screened based on whether the study was related to the topic of interest. All duplications (N=3) were then removed from the data and a final sample of 20 studies was retrieved. The citations for the 20 articles were read to establish inclusion into the systematic review. After reviewing the 20 retrieved articles 12 were excluded based on the methodology used in the study as only quantitative and intervention studies formed part of the inclusion criteria. The final inclusion sample consisted of eight articles which were based on the methodological quality of the study. A methodological quality assessment tool from previous research [20Roman NV, Frantz JM. The prevalence of intimate partner violence in the family: a systematic review of the implications for adolescents in Africa. Fam Pract 2013; 30(3): 256-65. 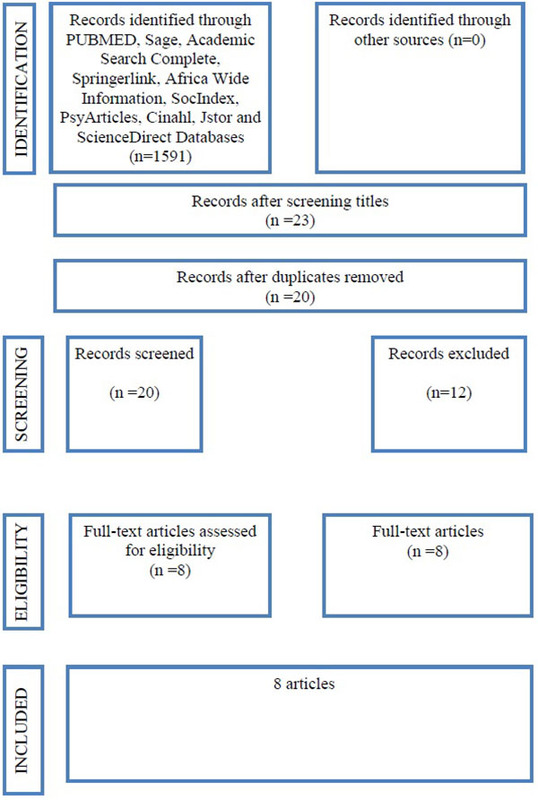 [http://dx.doi.org/10.1093/fampra/cms084] [PMID: 23363539] ] was adapted and used to appraise each article (Table 2). Each article was appraised and scored. The total was then converted to percentages as seen in Table 3. The final sample consisted of (8) articles as represented in the process flowchart (Fig. 1 ). The data extraction sheet was designed to identify information pertaining to the author, date of publication, country, population (sample size, age, gender), study design, measuring tool used for data collection, definition of knowledge of child development, definition of parenting/parenting styles and results (Table 4). Scoring sheet for the critical appraisal. Of the initial 23 studies only eight studies were included in the review. The reviewers decided that studies scoring 50% and above will be included in the review. Of the eight studies three [21Arnott B, Brown A. An exploration of parenting behaviours and attitudes during early infancy: association with maternal and infant characteristics. Infant Child Dev 2013; 22: 349-61. [http://dx.doi.org/10.1002/icd.1794] -23Bornstein MH, Putnick DL. Chronological age, cognitions, and practices in European American mothers: a multivariate study of parenting. Dev Psychol 2007; 43(4): 850-64. [http://dx.doi.org/10.1037/0012-1649.43.4.850] [PMID: 17605519] ] scored below average (50%) for the methodological appraisal. Of the nine questions on the critical appraisal tool which was applied to each study to appraise the quality; these studies only answered four questions hence the below average score. Though the studies fell below the average of 50% it still fell within the category of satisfactory to good. Furthermore these studies were included in the review as they contained valid content information pertaining to the research question. The studies, in the final sample, were one from Turkey [24Oncu EC, Unluer E. Parents’ attitude towards their children before and after parental education. Social Behav Sci 2012; 46: 5933-6. ], three from Canada [22Pevalin DJ, Wade TJ, Brannigan A. Parental assessment of early childhood development: biological and social covariates. Infant Child Dev 2003; 12: 167-75. [http://dx.doi.org/10.1002/icd.285] , 25Morawska A, Sanders MR. Concurrent predictors of dysfunctional parenting and maternal confidence: implications for parenting interventions. Child Care Health Dev 2007; 33(6): 757-67. [http://dx.doi.org/10.1111/j.1365-2214.2007.00758.x] [PMID: 17944786] , 26Winter L, Morawska A, Sanders MR. The effect of behavioral family intervention on knowledge of effective parenting strategies. J Child Fam Stud 2012; 21: 881-90. [http://dx.doi.org/10.1007/s10826-011-9548-y] ], one from the United Kingdom [21Arnott B, Brown A. An exploration of parenting behaviours and attitudes during early infancy: association with maternal and infant characteristics. Infant Child Dev 2013; 22: 349-61. [http://dx.doi.org/10.1002/icd.1794] ] and three from the United States of America [23Bornstein MH, Putnick DL. Chronological age, cognitions, and practices in European American mothers: a multivariate study of parenting. Dev Psychol 2007; 43(4): 850-64. [http://dx.doi.org/10.1037/0012-1649.43.4.850] [PMID: 17605519] , 27Hess CR, Teti DM, Hussey-Gardner B. Self-efficacy and parenting of high-risk infants: The moderating role of parent knowledge of infant development. Appl Dev Psychol 2004; 25: 423-37. [http://dx.doi.org/10.1016/j.appdev.2004.06.002] , 28Winsler A, Madigan AL, Aquilino SA. Correspondence between maternal and paternal parenting styles in early childhood. Early Child Res Q 2005; 20: 1-12. [http://dx.doi.org/10.1016/j.ecresq.2005.01.007] ]. Data was collected by means of questionnaires in all of the studies. The sample sizes ranged from 41 participants to 8605 participants. The participants in the studies were parents of children of varying ages with the youngest being under 12 months and the oldest 10 years old. Two of the studies were cross-sectional [21Arnott B, Brown A. An exploration of parenting behaviours and attitudes during early infancy: association with maternal and infant characteristics. Infant Child Dev 2013; 22: 349-61. [http://dx.doi.org/10.1002/icd.1794] , 25Morawska A, Sanders MR. Concurrent predictors of dysfunctional parenting and maternal confidence: implications for parenting interventions. Child Care Health Dev 2007; 33(6): 757-67. [http://dx.doi.org/10.1111/j.1365-2214.2007.00758.x] [PMID: 17944786] ], two were longitudinal studies Hess, Teti & Hussey-Gardner, 2004) and three were intervention studies [24Oncu EC, Unluer E. Parents’ attitude towards their children before and after parental education. Social Behav Sci 2012; 46: 5933-6., 26Winter L, Morawska A, Sanders MR. The effect of behavioral family intervention on knowledge of effective parenting strategies. J Child Fam Stud 2012; 21: 881-90. [http://dx.doi.org/10.1007/s10826-011-9548-y] , 28Winsler A, Madigan AL, Aquilino SA. Correspondence between maternal and paternal parenting styles in early childhood. Early Child Res Q 2005; 20: 1-12. [http://dx.doi.org/10.1016/j.ecresq.2005.01.007] ]. The final study was a population study [22Pevalin DJ, Wade TJ, Brannigan A. Parental assessment of early childhood development: biological and social covariates. Infant Child Dev 2003; 12: 167-75. Four of the eight studies provide a definition relating to either parenting or parenting styles. The study of Oncu and Uluer [24Oncu EC, Unluer E. Parents’ attitude towards their children before and after parental education. Social Behav Sci 2012; 46: 5933-6.] defines parenting as consisting of a complex of duties and responsibilities in which mother and/or father has to decide how to organize and guide their son/daughter. Two of the studies provide a definition which relates to parenting confidence which is defined as the parents’ perception that they can effectively manage tasks relating to parenting [25Morawska A, Sanders MR. Concurrent predictors of dysfunctional parenting and maternal confidence: implications for parenting interventions. Child Care Health Dev 2007; 33(6): 757-67. [http://dx.doi.org/10.1111/j.1365-2214.2007.00758.x] [PMID: 17944786] , 27Hess CR, Teti DM, Hussey-Gardner B. Self-efficacy and parenting of high-risk infants: The moderating role of parent knowledge of infant development. Appl Dev Psychol 2004; 25: 423-37. [http://dx.doi.org/10.1016/j.appdev.2004.06.002] ]. The study conducted by Arnott and Brown [21Arnott B, Brown A. An exploration of parenting behaviours and attitudes during early infancy: association with maternal and infant characteristics. Infant Child Dev 2013; 22: 349-61. [http://dx.doi.org/10.1002/icd.1794] ] cites Baumrind [29Baumrind D. Parental discipline and social competence in children. Youth Soc 1978; 9: 238-76.] in defining parenting styles as traditionally conceptualizing parenting behaviours as individual differences along two dimensions: warmth/nurturance and control. Combinations of these elements categorize parenting style typologies. Neither of the studies included in this review provide a clear definition for knowledge of child development but the content explores the issue of parental knowledge or cognitions of which one of the aspects is knowledge of child development [23Bornstein MH, Putnick DL. Chronological age, cognitions, and practices in European American mothers: a multivariate study of parenting. Dev Psychol 2007; 43(4): 850-64. [http://dx.doi.org/10.1037/0012-1649.43.4.850] [PMID: 17605519] , 25Morawska A, Sanders MR. Concurrent predictors of dysfunctional parenting and maternal confidence: implications for parenting interventions. Child Care Health Dev 2007; 33(6): 757-67. [http://dx.doi.org/10.1111/j.1365-2214.2007.00758.x] [PMID: 17944786] -27Hess CR, Teti DM, Hussey-Gardner B. Self-efficacy and parenting of high-risk infants: The moderating role of parent knowledge of infant development. Appl Dev Psychol 2004; 25: 423-37. Of the eight studies, four studies discuss and explore knowledge of child development [23Bornstein MH, Putnick DL. Chronological age, cognitions, and practices in European American mothers: a multivariate study of parenting. Dev Psychol 2007; 43(4): 850-64. [http://dx.doi.org/10.1016/j.appdev.2004.06.002] ]. In the Hess, Teti and Hussey-Gardner [27Hess CR, Teti DM, Hussey-Gardner B. Self-efficacy and parenting of high-risk infants: The moderating role of parent knowledge of infant development. Appl Dev Psychol 2004; 25: 423-37. [http://dx.doi.org/10.1016/j.appdev.2004.06.002] ] study, participants scored an average of 82.87%, which was considered relatively high. Mothers with higher education and income and who were married had increased knowledge when compared to mothers who had lower education, lower income and were unmarried. Furthermore, mothers who had increased knowledge of child development were more sensitive to their children. The study also found that Caucasian mothers had more knowledge of child development than African American mothers. The Bornstein and Putnick [23Bornstein MH, Putnick DL. Chronological age, cognitions, and practices in European American mothers: a multivariate study of parenting. Dev Psychol 2007; 43(4): 850-64. [http://dx.doi.org/10.1037/0012-1649.43.4.850] [PMID: 17605519] ] study highlighted that the degree of knowledge varied according to age and found that older mothers were more knowledgeable than younger mothers. However, the difference was not significant. Morawska and Sanders [25Morawska A, Sanders MR. Concurrent predictors of dysfunctional parenting and maternal confidence: implications for parenting interventions. Child Care Health Dev 2007; 33(6): 757-67. [http://dx.doi.org/10.1111/j.1365-2214.2007.00758.x] [PMID: 17944786] ] add that having knowledge of factors, which correlate to toddler behaviour may facilitate improved understanding of the factors that are important to develop interventions and programmes. While Morawska and Sanders [25Morawska A, Sanders MR. Concurrent predictors of dysfunctional parenting and maternal confidence: implications for parenting interventions. Child Care Health Dev 2007; 33(6): 757-67. [http://dx.doi.org/10.1111/j.1365-2214.2007.00758.x] [PMID: 17944786] ] do not specifically focus on parental knowledge they do investigate confidence, which has been found to be dependent on parental knowledge. The study results show that parents often did not know what to do when children threw tantrums; that their parenting style affects child behaviour and they also did not know about setting limits. A later study conducted by Winter, Morawska and Sanders [26Winter L, Morawska A, Sanders MR. The effect of behavioral family intervention on knowledge of effective parenting strategies. J Child Fam Stud 2012; 21: 881-90. [http://dx.doi.org/10.1007/s10826-011-9548-y] ] reports that pre-intervention parents in the higher socio-economic status group were found to have greater knowledge of child development. However, post parenting intervention parental knowledge and confidence was increased in both low and high socio-economic groups. The study further suggests that parents in high socio-economic groups would benefit from opportunities to practice their skills and receive feedback whereas the focus for low socio-economic status parents should be on teaching new skills and strategies to improve knowledge and confidence. The results of this review found that mothers with higher education, higher income and married were more responsive to their children than less educated, lower income and unmarried mothers. Furthermore, parent confidence was high but naively confident mothers may be at risk for parenting difficulties as their children grow into toddlers [27Hess CR, Teti DM, Hussey-Gardner B. Self-efficacy and parenting of high-risk infants: The moderating role of parent knowledge of infant development. Appl Dev Psychol 2004; 25: 423-37. [http://dx.doi.org/10.1016/j.appdev.2004.06.002] ]. In trying to understand the parenting approaches used in the phase of early childhood development, the studies in this review show that nurturance and control strongly emerged in this phase of development. For example mothers high in nurturance would cuddle their child instead of leaving the child to settle, mothers high on the discipline believed that they had to modify their child’s behaviour and were not particularly swayed by their infants for example believing that crying was used to manipulate them, while mothers high in routine would adhere to sticking to a strict routine for their baby [21Arnott B, Brown A. An exploration of parenting behaviours and attitudes during early infancy: association with maternal and infant characteristics. Infant Child Dev 2013; 22: 349-61. [http://dx.doi.org/10.1002/icd.1794] ]. When these factors are converted into Baumrind’s typology of parenting styles they found that mothers high in routine, discipline and low in nurturance could be considered authoritarian, whereas mothers high in nurturance with intermediate levels of routine and discipline may be viewed as authoritative [21Arnott B, Brown A. An exploration of parenting behaviours and attitudes during early infancy: association with maternal and infant characteristics. Infant Child Dev 2013; 22: 349-61. Furthermore mothers with high anxiety were more likely to seek advice and guidance from others whereas their counterparts were more likely to progress their child and compared the child to others of the same age. Lastly, parenting style was also associated to maternal age and education [21Arnott B, Brown A. An exploration of parenting behaviours and attitudes during early infancy: association with maternal and infant characteristics. Infant Child Dev 2013; 22: 349-61. Yet another study [25Morawska A, Sanders MR. Concurrent predictors of dysfunctional parenting and maternal confidence: implications for parenting interventions. Child Care Health Dev 2007; 33(6): 757-67. [http://dx.doi.org/10.1111/j.1365-2214.2007.00758.x] [PMID: 17944786] ] concluded that maternal confidence and dysfunctional parenting were interrelated and were also predicted best by parenting variables, in contrast to socio-demographic and child variables. Maternal confidence also mediated the relationships between family income and toddler behaviour. Parenting style and confidence are important modifiable factors to target in parenting interventions. The last study [22Pevalin DJ, Wade TJ, Brannigan A. Parental assessment of early childhood development: biological and social covariates. Infant Child Dev 2003; 12: 167-75. [http://dx.doi.org/10.1002/icd.285] ] reported that parental depression and hostile parenting were not found to have significant effects contrary to previous findings. Furthermore, parental depression suggests an impediment to optimal parenting practices but the models included direct measures of parenting and in their presence the effect of depression became non-significant. Therefore, the effects of depression appear to operate through resultant parenting practices. Similarly, hostile parenting has been shown to have a deleterious effect on development and the measure used in these analyses had a significant negative effect but was non-significant in the presence of a measure of positive parenting. The study by Oncu and Unluer [24Oncu EC, Unluer E. Parents’ attitude towards their children before and after parental education. Social Behav Sci 2012; 46: 5933-6.] reported that mothers were found to restrict father involvement. Subsequently, both mothers and fathers were found to score high in protective and discipline dimensions with fathers scoring higher in these dimensions and being more protective. Similarly, Winsler, Madigan and Aquilano [28Winsler A, Madigan AL, Aquilino SA. Correspondence between maternal and paternal parenting styles in early childhood. Early Child Res Q 2005; 20: 1-12. [http://dx.doi.org/10.1016/j.ecresq.2005.01.007] ] reported that fathers perceived their spouses to be more authoritative followed by permissive whereas mothers perceived their spouses as more authoritative. It was further found that parents who share similar parenting styles were able to report accurately on their spouses parenting styles. The study concluded that corresponding parenting styles in the same home were important. The study of Winsler, Madigan and Auilano [28Winsler A, Madigan AL, Aquilino SA. Correspondence between maternal and paternal parenting styles in early childhood. Early Child Res Q 2005; 20: 1-12. [http://dx.doi.org/10.1016/j.ecresq.2005.01.007] ] investigated the differences between maternal and paternal parenting style and found that there was a variance in parenting styles and little agreement between two parents in the same house with a pre-school aged child. The fathers reported that they perceived their spouses to be more authoritative or permissive whereas they perceived themselves to be more authoritarian. 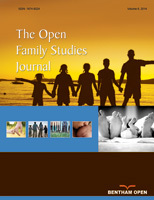 Furthermore the study states that it may be that parents perceived that there were greater differences between each others’ styles than indicated by self-reported parenting style due to (a) parents’ beliefs that traditional parenting stereotypes reflect effective parenting practices and (b) that self-reported parenting style in turn reflects those beliefs. This might suggest that parents’ perceptions of others’ parenting style is a more accurate indicator of true parenting behaviours compared to self-reported parenting style, and is thus an important question for future researchers. This study however did not explore knowledge of child development in relation to parenting but it explored differences between paternal and maternal parenting styles. Another study, Oncu & Unleur [24Oncu EC, Unluer E. Parents’ attitude towards their children before and after parental education. Social Behav Sci 2012; 46: 5933-6. ], investigated whether parental attitudes changed after parental education. The results of the study found that parenting education, which increases knowledge, had a positive effect on positive parenting, pressure and discipline dimensions and found that fathers scored higher in protective parenting than the mothers. However this study was conducted with 26 parents and the limitation included that topics discussed on healthy child development were limited, the change effect was small and father participation was not consistent or equal. Three of the studies reviewed [25Morawska A, Sanders MR. Concurrent predictors of dysfunctional parenting and maternal confidence: implications for parenting interventions. Child Care Health Dev 2007; 33(6): 757-67. [http://dx.doi.org/10.1007/s10826-011-9548-y] ] found that maternal confidence and dysfunctional parenting were interrelated and that knowledge of child development was a moderating factor. Winter, Morawska and Sanders [26Winter L, Morawska A, Sanders MR. The effect of behavioral family intervention on knowledge of effective parenting strategies. J Child Fam Stud 2012; 21: 881-90. [http://dx.doi.org/10.1007/s10826-011-9548-y] ] found that the effect for confidence was larger than that for knowledge of child development. Two of the studies included in the review [21Arnott B, Brown A. An exploration of parenting behaviours and attitudes during early infancy: association with maternal and infant characteristics. Infant Child Dev 2013; 22: 349-61. [http://dx.doi.org/10.1002/icd.1794] ] [23Bornstein MH, Putnick DL. Chronological age, cognitions, and practices in European American mothers: a multivariate study of parenting. Dev Psychol 2007; 43(4): 850-64. [http://dx.doi.org/10.1037/0012-1649.43.4.850] [PMID: 17605519] ] concluded that maternal age and education were a pervasive factor in cognition and parenting. However the correlation between parenting and maternal age and cognition was higher for younger mothers as opposed to older mothers [23Bornstein MH, Putnick DL. Chronological age, cognitions, and practices in European American mothers: a multivariate study of parenting. Dev Psychol 2007; 43(4): 850-64. [http://dx.doi.org/10.1037/0012-1649.43.4.850] [PMID: 17605519] ]. The study of Pevalin, Wade & Brannigan [22Pevalin DJ, Wade TJ, Brannigan A. Parental assessment of early childhood development: biological and social covariates. Infant Child Dev 2003; 12: 167-75. [http://dx.doi.org/10.1002/icd.285] ] did not directly investigate knowledge of child development but concludes that dysfunctional and hostile parenting has a negative effect on early child development. The findings suggest that maternal education, positive parenting and social support may counter the negative effect on the child’s development process. All the studies reported on the measuring instruments that were used include what the instrument is designed to measure. Two studies used the Knowledge of Infant Development inventory (KIDI) to assess mothers’ knowledge of child development, parental practices, health and safety and norms [23Bornstein MH, Putnick DL. Chronological age, cognitions, and practices in European American mothers: a multivariate study of parenting. Dev Psychol 2007; 43(4): 850-64. [http://dx.doi.org/10.1016/j.appdev.2004.06.002] ]. However Hess, Teti and Hussey-Gardner [27Hess CR, Teti DM, Hussey-Gardner B. Self-efficacy and parenting of high-risk infants: The moderating role of parent knowledge of infant development. Appl Dev Psychol 2004; 25: 423-37. [http://dx.doi.org/10.1016/j.appdev.2004.06.002] ] used only a portion of the KIDI namely the parenting subscale to measure knowledge against parenting. Of the eight studies conducted [21Arnott B, Brown A. An exploration of parenting behaviours and attitudes during early infancy: association with maternal and infant characteristics. Infant Child Dev 2013; 22: 349-61. [http://dx.doi.org/10.1002/icd.1794] -28Winsler A, Madigan AL, Aquilino SA. Correspondence between maternal and paternal parenting styles in early childhood. Early Child Res Q 2005; 20: 1-12. [http://dx.doi.org/10.1016/j.ecresq.2005.01.007] ] several parenting questionnaires were used to measure parental competence, behaviour and style of which three studies used the Parenting Style Dimension Questionnaire (PSDQ) to determine the participant’s parenting style category [21Arnott B, Brown A. An exploration of parenting behaviours and attitudes during early infancy: association with maternal and infant characteristics. Infant Child Dev 2013; 22: 349-61. [http://dx.doi.org/10.1002/icd.1794] , 23Bornstein MH, Putnick DL. Chronological age, cognitions, and practices in European American mothers: a multivariate study of parenting. Dev Psychol 2007; 43(4): 850-64. [http://dx.doi.org/10.1037/0012-1649.43.4.850] [PMID: 17605519] , 28Winsler A, Madigan AL, Aquilino SA. Correspondence between maternal and paternal parenting styles in early childhood. Early Child Res Q 2005; 20: 1-12. [http://dx.doi.org/10.1016/j.ecresq.2005.01.007] ]. Another two studies use the Eyberg Child Behavior Inventory (ECBI), which measures parental perception of children’s problematic behaviour. Four studies [21Arnott B, Brown A. An exploration of parenting behaviours and attitudes during early infancy: association with maternal and infant characteristics. Infant Child Dev 2013; 22: 349-61. [http://dx.doi.org/10.1002/icd.1794] , 22Pevalin DJ, Wade TJ, Brannigan A. Parental assessment of early childhood development: biological and social covariates. Infant Child Dev 2003; 12: 167-75. [http://dx.doi.org/10.1002/icd.285] , 24Oncu EC, Unluer E. Parents’ attitude towards their children before and after parental education. Social Behav Sci 2012; 46: 5933-6., 28Winsler A, Madigan AL, Aquilino SA. Correspondence between maternal and paternal parenting styles in early childhood. Early Child Res Q 2005; 20: 1-12. [http://dx.doi.org/10.1016/j.ecresq.2005.01.007] ] used a single instrument while the remaining four used more than one instrument [23Bornstein MH, Putnick DL. Chronological age, cognitions, and practices in European American mothers: a multivariate study of parenting. Dev Psychol 2007; 43(4): 850-64. [http://dx.doi.org/10.1016/j.appdev.2004.06.002] ]. However regardless of which instrument was used the measures reported to have adequate to high internal consistency. The studies reviewed did not provide clarity on a definition for knowledge of child development and parental knowledge and therefore the results do not clearly reflect that there is an association between knowledge of child development and parenting. There were studies that indicated that there are other factors that influence parenting such as maternal age, maternal education, socio-economic status however, knowledge of child development appears to be a moderating factor [21Arnott B, Brown A. An exploration of parenting behaviours and attitudes during early infancy: association with maternal and infant characteristics. Infant Child Dev 2013; 22: 349-61. [http://dx.doi.org/10.1037/0012-1649.43.4.850] [PMID: 17605519] , 26Winter L, Morawska A, Sanders MR. The effect of behavioral family intervention on knowledge of effective parenting strategies. J Child Fam Stud 2012; 21: 881-90. [http://dx.doi.org/10.1007/s10826-011-9548-y] ]. These findings are therefore similar to study conducted by September, Rich and Roman [30September SJ, Rich EG, Roman NV. The role of parenting styles and socio-economic status in parents’ knowledge of child development. Early Child Dev Care 2015; 1-19.] which found that no positive correlation exist between knowledge of child development and parenting instead there were other aspects to consider. Though knowledge of child development is a moderating factor the results indicate that parental education improved knowledge and confidence thus reducing dysfunctional parenting and less externalised behaviour in children [26Winter L, Morawska A, Sanders MR. The effect of behavioral family intervention on knowledge of effective parenting strategies. J Child Fam Stud 2012; 21: 881-90. [http://dx.doi.org/10.1007/s10826-011-9548-y] ]. There are different domains or dimensions to parenting such as parenting behaviour, parenting practices, parenting style and parenting confidence [6Darling N, Steinberg L. Parenting style as context: An integrative model. Psychol Bull 1993; 113: 487-96. [http://dx.doi.org/10.1037/0033-2909.113.3.487] ]. Due to the varying dimensions of parenting with the studies included varying in its focus there is no clear conclusion regarding the association of knowledge of child development and parenting. This systematic review highlights that there are few research studies which have been conducted on knowledge of child development and parenting. While the review includes cross-sectional studies, longitudinal studies and intervention studies none of these types of studies are without limitations. Cross-sectional studies are conducted at one point in time [31Thisted RA. The Cross-sectional study: Investigating prevalence and association. Department of Health Studies and Statistics. University of Chicago 2006.] and the limitation in this is that the time span of the study is not long enough to ascertain whether one variable affects another. Also these studies are conducted on different demographic samples and sizes and generalizability can often not be assumed. There is evidence that childrearing principles and practices change over time and therefore longitudinal studies may be more beneficial. Few studies highlighted that the sample was not necessarily equally distributed or fully representative of the entire population therefore impacting on generalizability considering that there may be other determining factors that play a role when assessing parenting style such as culture, age, socio-economic status and education. Finally most of the studies utilised self-report questionnaires which impact on the information collected as reporting may be on what is perceived by the participant and may not be actual, which may impact on the findings. Perhaps it would be beneficial to use self-reporting instruments in conjunction with observational measures or other forms of assessment. This review highlighted the scarcity in previous research conducted in determining the association of knowledge of child development and parenting styles. The quantitative and intervention studies that were conducted and included in this review did not present clear definitions of knowledge of child development and parenting styles. Furthermore it did not provide concrete evidence of the association between knowledge of child development and parenting styles although the results allude to knowledge being a moderating factor in parenting. Future research studies would benefit from including other forms of assessment in conjunction with self-report measures to gain better insight into the study of parental knowledge and parenting style. In addition, perhaps longitudinal studies with a pre and post study design will provide a better indication of this relationship and the possibility of determining effects between variables. Encyclopedia on Early Child Development. Can changing parental knowledge, dysfunctional expectations and attributions, and emotion regulation improve outcomes for children? In: Morawska MR, Sanders A, Eds. Parental Skills, 3rd ed. University of Queensland, Australia, 2005. Landry SH, Smith KE, Swank PR. Responsive parenting: establishing early foundations for social, communication, and independent problem-solving skills. Dev Psychol 2006; 42(4): 627-42. Stright AD, Gallagher KC, Kelley K. Infant temperament moderates relations between maternal parenting in early childhood and childrens adjustment in first grade. Child Dev 2008; 79(1): 186-200. Jackson AP, Schemes R. Single mothers' self-efficacy, parenting in the home environment, and children's development in a two-wave study. Soc Work Res 2005; 29: 7-20. Slicker E, Picklesimer B, Guzak A, Fuller D. The relationship of parenting style and older adolescent life skills development in the united states. Young 2005; 13: 227-45. Darling N, Steinberg L. Parenting style as context: An integrative model. Psychol Bull 1993; 113: 487-96. Elstad JI, Stefansen K. Social variations in perceived parenting styles among norwegian adolescents. Child Indic Res 2014; 7: 649-70. Huang K, Caughy MO, Genevro JL, Miller TL. Maternal knowledge of child development and quality of parenting among White, African-American and Hispanic mothers. J Appl Dev Psychol 2005; 26: 149-70. Bornstein MH, Cote LR, Haynes OM, Hahn CS, Park Y. Parenting knowledge: experiential and sociodemographic factors in European American mothers of young children. Dev Psychol 2010; 46(6): 1677-93. Tamis-LeMonda CS, Shannon J, Spellmann M. Low-income adolescent mothers’ knowledge about domains of child development. Infant Ment Health J 2002; 23: 88-103. Zand D, Pierce K, Thomson N, et al. Social competence in infants and toddlers with special health care needs: the roles of parental knowledge, expectations, attunement, and attitudes toward child independence. Children (Basel) 2014; 1(1): 5-20. Bornstein MH, Hahn CS, Suwalsky JT, Haynes OM. Socioeconomic status, parenting, and child development: the hollingshead four-factor index of social status and the socioeconomic index of occupations. In: Bornstein MH, Bradley RH, Eds. Socioeconomic status, parenting, and child development. Mahwah, NJ: Erlbaum 2003; pp. 29-82. Smith TK. The relationship between knowledge, attributions and behavior in adolescent mothers: Implications for child outcomes. Santa Barbara: University of California 2001. Biringen Z, Easterbrooks AE. Understanding relationships and relationship interventions. J Early Child Infant Psychol 2008; 4: 1-3. Zhou Q, Eisenberg N, Losoya SH, et al. The relations of parental warmth and positive expressiveness to childrens empathy-related responding and social functioning: a longitudinal study. Child Dev 2002; 73(3): 893-915. Akinsola EF. Relationship between parenting styles, family type, personality disposition and academic achievement of young people in Nigeria. Ife PsychologIA 2011; 19: 246. Hoff E, Laursen B, Tardiff T. Socioeconomic status and parenting. In: Bornstein MH, Ed. Biology and ecology of parenting. Mahwah, NJ: Lawrence Erlbaum Associates Handbook of parenting 2002; pp. 231-52. Morrison GS. Parent involvement in the home, school and community. OH: Chas E Merrill Publishing Company 1978. Roman NV, Frantz JM. The prevalence of intimate partner violence in the family: a systematic review of the implications for adolescents in Africa. Fam Pract 2013; 30(3): 256-65. Arnott B, Brown A. An exploration of parenting behaviours and attitudes during early infancy: association with maternal and infant characteristics. Infant Child Dev 2013; 22: 349-61. Pevalin DJ, Wade TJ, Brannigan A. Parental assessment of early childhood development: biological and social covariates. Infant Child Dev 2003; 12: 167-75. Bornstein MH, Putnick DL. Chronological age, cognitions, and practices in European American mothers: a multivariate study of parenting. Dev Psychol 2007; 43(4): 850-64. Oncu EC, Unluer E. Parents’ attitude towards their children before and after parental education. Social Behav Sci 2012; 46: 5933-6. Morawska A, Sanders MR. Concurrent predictors of dysfunctional parenting and maternal confidence: implications for parenting interventions. Child Care Health Dev 2007; 33(6): 757-67. Winter L, Morawska A, Sanders MR. The effect of behavioral family intervention on knowledge of effective parenting strategies. J Child Fam Stud 2012; 21: 881-90. Hess CR, Teti DM, Hussey-Gardner B. Self-efficacy and parenting of high-risk infants: The moderating role of parent knowledge of infant development. Appl Dev Psychol 2004; 25: 423-37. Winsler A, Madigan AL, Aquilino SA. Correspondence between maternal and paternal parenting styles in early childhood. Early Child Res Q 2005; 20: 1-12. Baumrind D. Parental discipline and social competence in children. Youth Soc 1978; 9: 238-76. September SJ, Rich EG, Roman NV. The role of parenting styles and socio-economic status in parents’ knowledge of child development. Early Child Dev Care 2015; 1-19. Thisted RA. The Cross-sectional study: Investigating prevalence and association. Department of Health Studies and Statistics. University of Chicago 2006.